Cashing in on the craze for "Retro Games" this hand cramping handheld/plug-and-play delivers an ultimately unsatisfying NES style experience that is hampered by several perplexing design choices. Nice thumbstick though! As depressing as it may be to those of us who once enjoyed scouring Ebay and charity shops for the beloved video-games of our misspent youth, there is no denying that the cult of retro-gaming has now reached a zenith of popularity that has all but sapped the fun out of it for bargain hunting nostalgia seekers like us. We’ve now reached the point where even Nintendo has seen the profit in the past and companies remain keen to cash in on our rose-tinted visions of the 8-bit years. At the same time, a rather more inexplicable issue has arisen. A recent generation, raised on Xbox and Playstation has begun to experience a mysterious yearning for a time they never knew. Sensing a profit in pixels, equally young companies have begun marketing a new, or arguably more correct definition of ‘retro’ as the recreation, rather than the remembrance of the way things used to be. A cool and modern design aesthetic instead of a faded childhood memory. 8-bit chic for the millennials who never knew it as the beloved secret of teenage bedrooms. One such manufacturer was the company Performance Design Products who, during the mid-2000’s, brought a whole host of 8-bit style handhelds to the western market, selling them under their Pelican Accessories brand. While authentic classic licences such as ‘Frogger’ and ‘Burger Time’ were acquired and bundled with later handhelds, the majority of games on these devices were “original” games modeled after various 8-bit classics and designed by “developer” Jungletac to run on variants of the patent-expired Famicom hardware. 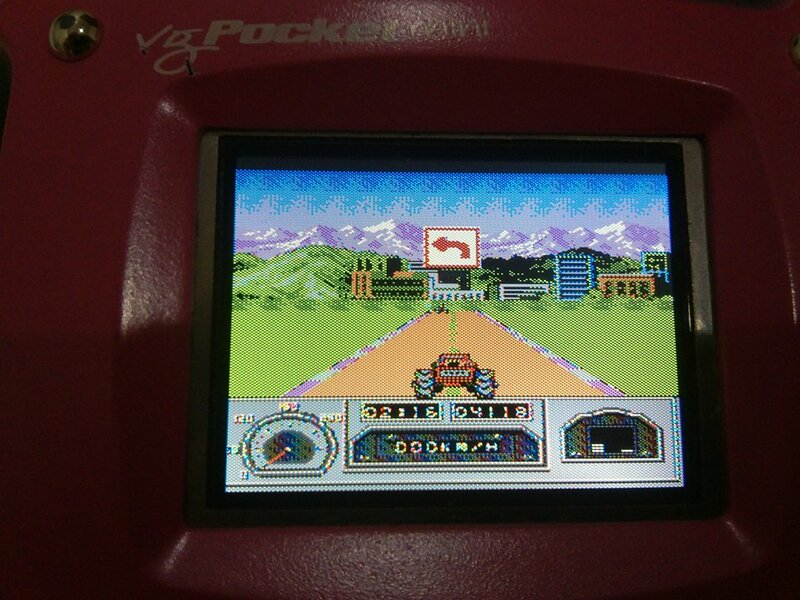 The VG Pocket Mini was the first of these systems and, as such, boasts an entirely “new” range of 8-bit styled games. However, as we will discover, many of them may seem oddly familiar. The decision to offer optional left and right handed fire-buttons is admirable. However we don't recall anybody expressing the desire to operate them with their index finger using a cramp-inducing pincer like grip. Face buttons are that way for a reason, folks! Firstly, though, lets talk about the system itself. We should preface this review by stating that these things are now pretty hard to come by, as they were a commercial failure that was quickly superseded by later models, as a result the version we acquired (loose) did not come with the AV cables necessary to test it on a TV screen (and it seems to be a quite fussy about only taking a particular set) so this review will talk purely about its capabilities as a handheld device. 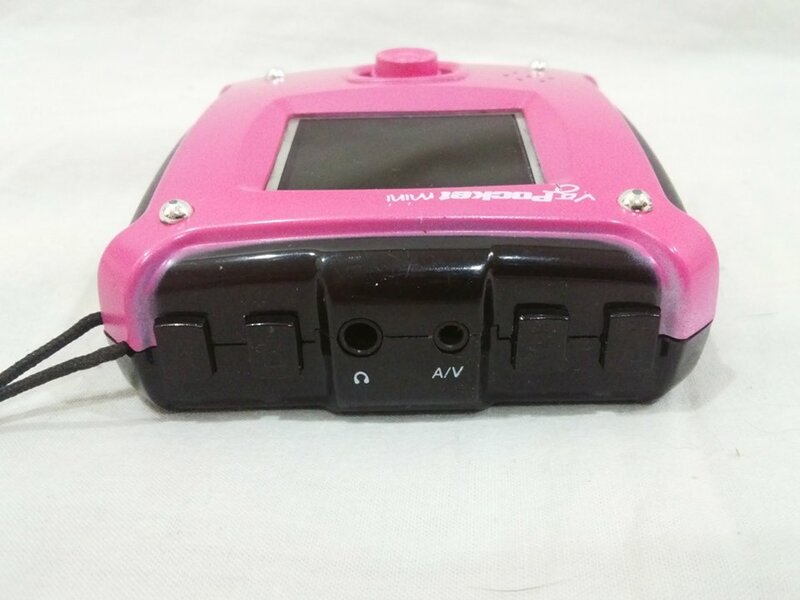 Although it came in other variants, the hot pink version we have is an unusual if refreshing design. The rubberized side-panels also give it a rather odd feeling and if you didn't know it was a console it might easily be confused for an early digital camera, especially given the lack of traditional d-pad and face buttons. Here we see the best and worst of design. As confirmed fans of the Neo Geo Pocket, the immediately alluring thing about the VG Pocket Mini is the almost identical micro-switched thumb-stick, a presumably costly decision that gives us hope for a back-lit clone console of that system akin to the GB Boy Colour one day appearing. 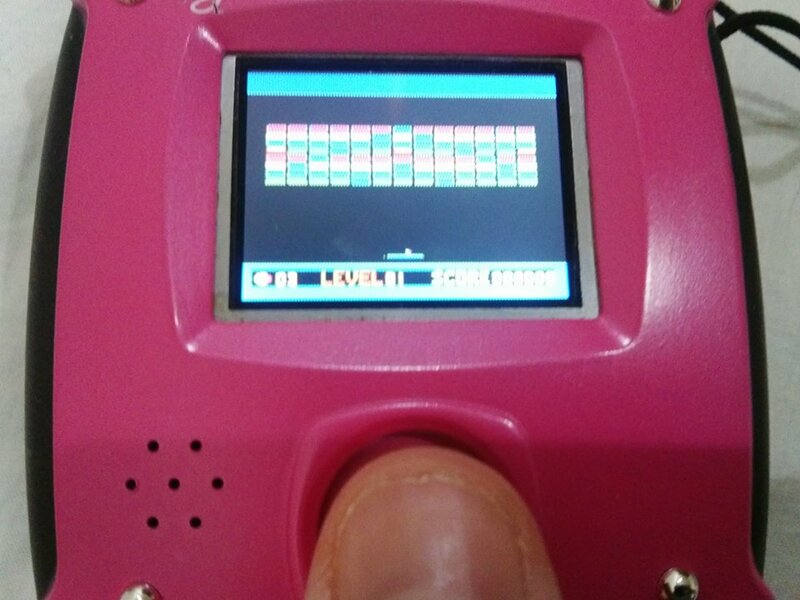 Given the number of terrible d-pads that seem to make their way out of China on handheld famiclones this is a staggering decision even if it is a welcome one. Its central placement feels comfortable however you choose to hold the device, with the drawback that there are no room for any face buttons! ​Unfortunately, this has meant that the system's A+B buttons have been relocated to the top of the device, where the L + R buttons would normally be on a Nintendo handheld. While two sets have been provided in a nod to left-handed gamers, this doesn't take away from the fact that it's our thumbs, not our index fingers, bent in some form of crab-like pincer movement that are used to doing the pushing and a few minutes of playing one of the system's shooters usually results in severe cramp, as a result. 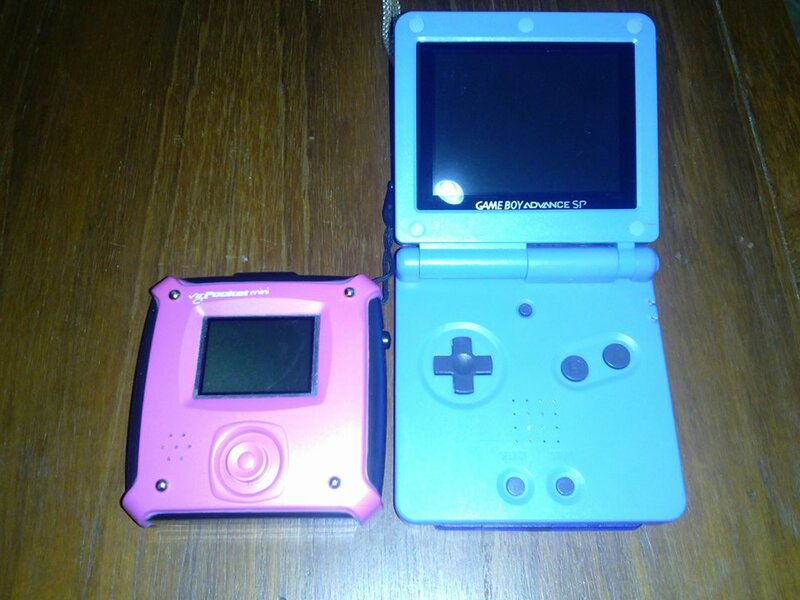 Design flaw number 2: While the system is approximately the size of a folded Game Boy advance SP, the 1.5" screen is barely the size of its own thumb-stick, while the graphics themselves are so tiny and compressed that you may need a microscope to see them. The next drawback comes with the system's screen. While later revisions of the hardware boosted screen size to 2" and 2.5" respectively, here you are stuck with a miniscule 1.5" display which, while beautifully back-lit, is simply not big enough to properly display the graphics with enough clarity to make out what is going on (particularly in the aforementioned shooters where bullets are all but invisible). Thankfully, it doesn't seem to be too much of a drain on the 3xAAA batteries required to power it and the device should run for many hours on these. Sound is, thankfully, decent, yet is instantly problematic due to being set at a default level of loud that can neither be quietened or muted. The only way to silence the machine is to plug in headphones, as there is no built in volume control. Fortunately, headphones are preferable, as the sound quality is much better in stereo that it is through the systems mono external speaker. Seriously though, its hard to understand how a company could invest in a clicky micro-switched thumb-stick for a controller but cut costs by not adding a simple volume slider! The menu is a perfunctory list of guesswork. Games themselves often have reasonably good graphics considering most are re-skins or clones of existing titles. Possibly because sprites have been lifted from existing games. So onto the most important factor of all: The games. 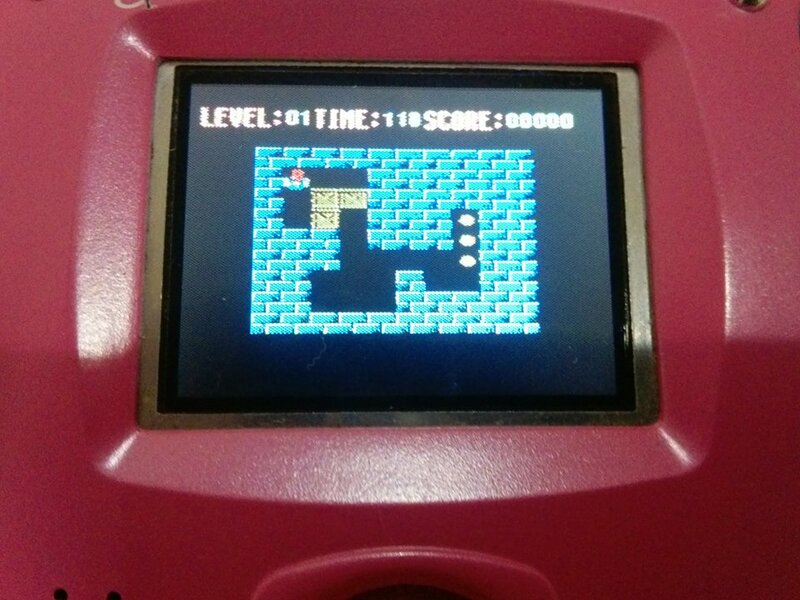 As mentioned, the device seems to be running on Famicom-on-a-chip technology and, while all of the games are labelled "original" on the packaging, astute eyes will recognize that many are simply re-skinned or cloned from existing properties. 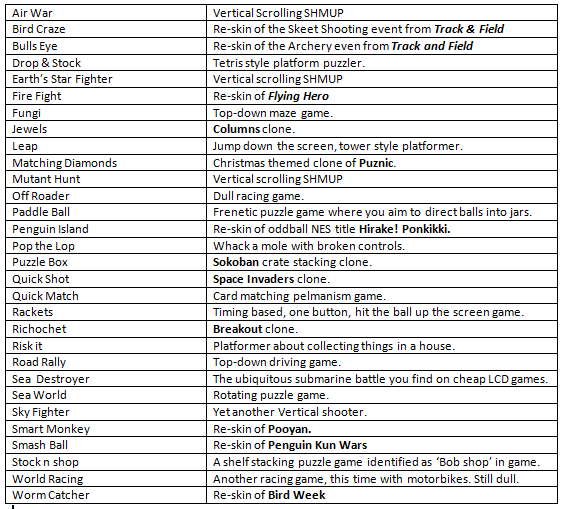 Firstly, let's look at the game list and see what we have among the 30 games built into the system. The list below shows the listed name on the left and the description and information on the right. Not exactly mouth-watering is it? Most of the famous names you might recognise are simple affairs like Columns or Breakout, while some, like the re-branded events from Track and Field aren't even complete games in themselves. There are an awful lot of vertical shooters which, in fairness, appear to be competently programmed. Unfortunately, on the system's tiny screen and using its cramped, uncomfortable controls they are almost impossible to enjoy...or indeed see! While the screen is clear and crisp the game choices were often not wise for such a tiny screen with tinier sprites or reduced screen size. The VG Pocket Mini seems to have fallen victim to that common fate of failed handhelds: choosing games that simply don't suit its design. So many of these titles are fast paced action games that rely on quick reaction and being able to clearly see what is going on that the 1.5" screen is abysmally inadequate to deal with them. Similarly the lack of an auto-fire in the shooters combined with the weird button positioning means that you'll suffer terminal arthritis in the joints of your index finger before you make it past the second stage (in the unlikely event of not being killed by bullets you can barely discern!). More puzzle games and platformers (which are surprisingly lacking) would have been much more welcome here. Overall, it's hard to fathom who the VG Pocket Mini was designed to appeal to. It won't scratch an itch for serious fans of classic gaming and its games aren't fun enough to appeal to millennial retro-hipsters either. Its annoying design flaws (wonderful thumb-stick aside) undoubtedly played a big part in its downfall and its not hard to see why PDP changed things up for the later models, adding more games including big name licenses and fixing problems with screen size and controls. Ultimately, the VG Pocket Mini remains a curious footnote in the retro boom, but one destined to leave no lasting imprint of lingering memory. Lovely clicky thumb-stick though! We can never have enough of those around!